Figuring out what causes of stress there are in our life is often very hard. When you are under pressure your body will react by making you more alert to specific elements, such as dangers. So if you are stressed, finding the cause or causes of stress (stressors) is even more difficult. ... Now, in isolation: The street crossing is one of the causes of stress in my life - one of my stressors. If I do not keep cool and remember my techniques, I start to sweat, hyperventilate, my heart starts pumping and I can feel my blood pressure inc	reasing. However, I am quite lucky since I can almost completely eliminate this stressor: If you ever see me at a crowed street crossing, you can find me at one of the sides and you will see me walk across a few seconds before the rest of the bunch. That keeps me away from the stressor. Disease. If you are suffering from an illness, you may be living with a high level of stress. Remember, that the stress also affects family and friends - sometimes even more! So also be wary of the signs of stress if you have someone close to you suffering from disease. The death of someone close to you is said to be a severe cause of stress. Especially if you lose your spouse or a child, the emotional stress is often too much. I advice people experiencing this kind of stress to seek professional counseling at least once, and to set up regular get-togethers (not meetings) with an understanding friend or relatives. Too much work is one of the quickest causes of stress. It is often what people first think of when you mention stress. This kind of stress is very common, and will often go away on its own when your workload falls (if it does so!). There are a lot of know stressors related to work - having too much of it, is just one kind! Bullying. Whether you are an adult, a child, a teenager or a senior - bullying is serious, and can lead to severe stress and stress related diseases. It doesn't matter, whether it happens in a work setting, at home, in school or on another planet (!). Family life and childbearing are two of the mildest stressors in general. Evolution has made us good (in general) at tackling the in-group, family stress that naturally arises as we interact with each other. Remember that if you feel stressed in family situations, chances are that other family members are feeling the same way. Also note that while women are generally well equipped at giving birth - it can be very stressful and that stress will also affect the father. Financial insecurity. This stressor is unpredictable due to the many different perceptions. Some may be financial secure, but still be stressed about it - they just don't feel very secure. And on the other hand many people are enjoying frugal, stress-free living without having their pockets full. It's all in the eyes of the beholder. Lifestyle related stressors. I lump the rest of the millions of stressors into this category just to point out that it is not possible to say what causes stress in every human. Obesity may be very stressful, but if you are stressed and obese, is it then the obesity itself? It may be physical stress caused by weight, or it may be emotional stress caused by living in a world that does not accept your way of life. The same goes for all the other lifestyle issues you hear about every day! It's easy to see, that a complete list of everything that can cause stress, is impossible to make! The causes listed here are just some of the most common, not the most severe. Among the worst stressors are normally: Death in the family, followed by financial insecurity, followed by disease, divorce or separation, loss of job, and retirement. We are all different. The important thing is that you learn to recognize what causes your stress and you learn to realize that you don't have to be stressed. Instead of trying to see every potential stressor in your life, use these below categories to try and figure out where your stressors are. ... or mental stress is stress caused by you own thoughts. It is very common but also difficult to cope with: Have you tried stopping your thoughts? - It is almost impossible! Thoughts, anxieties and worries can give you stress easily. Often you will feel the mental stress when trying to sleep or when you are otherwise free from external factors. Note the time of day, your emotional response (what you felt) and whether you had any physical response (tremors, sweaty palms, shivers and so) or if you had strange behaviour. The Stressor Chart can help you with this. Ask yourself if you are feeling stress in family situations. It may be something else, like occasional anger or irritation. Learn to see the signs of stress, and as always recognize it and realize that you don't have to be stressed. Are you talking on others stress? Notably when you shouldn't? If your child is sick or being bullied in school, stress-transfer is natural and makes you care for your child. However, if you are taking over your boss' stress when it is not your concern, you may have a problem on your hands. If you cannot fit the stress you recognize into the other four categories, label it "diffuse stress". This is not to say that there is anything wrong with you! You probably just need to work a bit more with your stress and maybe become a little better at describing your feelings to yourself. If you are patient, your causes of stress will become clear, and then you can mend the situation. If you want an easy way of noting your causes of stress, you can download the Stressor Chart to help you find your causes of stress. Print out the Stressor Chart and carry it with you. When you feel stressed during the day, write it down on the Stressor Chart. Page two of the PDF has a short description. I would recommend using the chart for at least a week. You can put a mark by your note, if you experience the same stress more than once. The normal signs of stress are being used in the chart, look here for more info on the signs of stress. Below is an example of how to use the stressor chart. The chart is meant as a guide to help you discover you causes of stress. 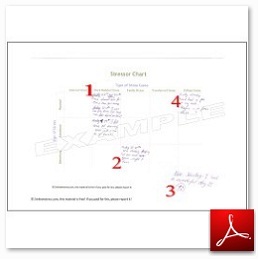 The example-PDF also includes a small evaluation of the example chart. When you do it, be careful not to overanalyze (which can cause stress by the way). You are trying to find your stressors, not playing "100 Possible Causes of Stress in My Life".